I am, basically, a tram and trolleybus enthusiast, and, unfortunately, I never had the pleasure of sampling the delights of the LCBER. By 1955, money was in short supply, and the trams were just about worn away, and the company decided to switch to motorbus operation. I did sample these, in 1956/7, and remember them with great affection. I think that the history of these buses, which succumbed to the mighty Crosville in 1961, has been largely overlooked, perhaps because of the nature of the tram to bus conversion, which was particularly noxious for a hard-core of true bred tramway enthusiasts! There were a dozen or so ex Southdown utility Arab 11s (as shot above), with 3 makes of body, supplemented by 2 later East Kent examples. There was also an ex-East Kent TD5 used only for the initial phase of driver training, and 2 ex Newcastle NCB bodied Daimler COG5s of 1939 vintage. One of the latter was converted to open top in 1956, and there were plans to likewise convert some of the Guys. I can vividly remember riding on the Guys, which reminded me at the time, of Bristol K5Gs, probably because of the crunchy gear change, not always well executed, and the growl of the 5LW. It would be very interesting to hear if other enthusiasts remember this fleet with the same affection as I do, and if there are any other photos out there! I do have an exact fleet list should interest demand it! Looks like Mostyn Street, Llandudno. Can anybody with more detailed knowledge of the area confirm or otherwise? This photo has brought very fond memories of by first visit to Llandudno in 1956. Seeing these Guy Arabs operating as an independent Tramway Company gave me a feeling of David and Goliath as Crosville seemed to be the main operator in the area. For once I ignored the Crosville buses and rode on the LCBER buses to their depot at Rhos-on-Sea where a few trams still remained in the yard. I have always found bus companies operating with Tramway names fascinating as they reflect a proud heritage. How many other bus companies were operating with Tramway Company names in the fifties? Sadly LCBER was taken over by Crosville in 1961. One company that springs to mind is the Northern subsidiary Tyneside Tramways and Tramroads. A title they kept until they disappeared into the parent company in the seventies. Great posting and wonderful photo John, thanks very much. It just goes to show that many of the most interesting items on OBP are about lesser known operators, and LCBER are an excellent example of that. They were clearly very cost conscious, buying wartime bodied Guy Arabs; many operators had rebodied such vehicles years earlier, and 11/12 year old ones were hardly in the first flush of youth. It’s also interesting that they bought a Leyland TD5 for driver training when they had no Leylands in service, as is the decision to buy the two Daimlers with, presumably, pre-selector gearboxes, amongst the (very) crash gearbox Guys. And how did passengers react to the replacement of smooth and quiet electric traction with trundling 5LW’s? A final question, John – what was LCBER’s livery? It looks smart in your photo, I must say. I can remember Bristol, and Bath Tramways in the 1950s when I was stationed at RAF Yatesbury in Wiltshire. I think this bus’s registration is GUF 153, which was Southdown’s 453, a Guy Arab II, 5LW. (Ch: FD27379), built Feb 1945. Its Northern Counties body (3737) started as H30/26R, was rebuilt to H28/26R and re-engined as a 6LW in Dec 1950, then re-engined to 5LW again prior to withdrawal and sale in July 1956. It was one to escape being converted to an open-topper, like many of its cousins. Whether they realised it or not, they bought wisely with a Guy with Northern Counties bodies, who were given dispensation during the war to build metal-framed bodies, which would have given them far longer lives then their ‘green’-wood, wooden-framed cousins. The windows were rather shallow and out-of-proportion, but they were still rather handsome beasts and looked just as nice beheaded! Sadly, Chris, the Tyneside and Tramroads name was abandoned in 1965 and thereafter the rather more prosaic Tyneside Omnibus Company had to suffice until it became one of the last Northern subsidiaries (along with Gateshead) to be fully absorbed in, I think, 1976. Apologies for the wrong registration GUF 351. Later access to a fleet list, and closer perusal of the photo, has shown this bus to be GUF 159. As Stephen says, it is in Mostyn Street, Llandudno as far as I can tell. 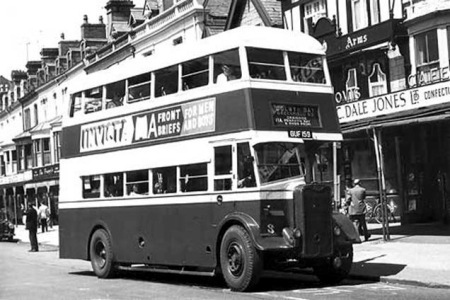 This bus was the second No.3, being purchased in 1957, to replace an identical vehicle, original No.3, GUF 128. Didn’t Bath Electric Tramways and Bath Tramways Motor Co survive until c.1972, when absorbed into BOC? I presume they did not continue with the green livery after tramway abandonment, in order to differentiate their vehicles from the Tilling green of Crosville. As Richard says, it was also very unusual for me too, to let Bristols go by, but this was a notable and worthy exception! Having asked the question, many thanks Nigel for the details of ex Tramway Companies operating buses in England. Another one that I am aware of is the Rothesay Tramway Company that ceased tramway operations on the Isle of Bute in 1936 but was operating bus services on the Isle with the tramway name to at least to 1951. Scottish postings do seem to be absent at moment so perhaps someone with Rothesay details can assist. I’ve only ever visited Llandudno once, and I must have been 6 or younger, as we went by bus from Bolton – moved from there in 1954, when I was 6 – to Liverpool, then by steamer to Llandudno. It was a day trip, and my parents commented frequently about the fact that it was so foggy on the way, we were in time to disembark and join the queue to return. So, I never saw the trams or their replacement buses! When I was about five years old (1958ish) I took a steamer ride out into the Irish Sea from Llandudno aboard a vessel called the St Tudno. A few years later it sank. Moving back to the buses, Pete must have had a very long day to go and see some fog. There were no direct bus routes from Bolton to Liverpool until after deregulation (and even then Merseybus’s 510 service was short-lived), so the trip would have involved changing at Wigan (to the 320) or Atherton (to the 39 from "Manchester" – actually Salford). Incidentally (here comes a bit of shameless self-promotion!) my new book on "Independent Buses in North Wales" will be out in the next few weeks and it includes the history of the L&CBER along with 29 other indies in the region. Just thought I’d let you know. Lovely photograph of No 3 on Mostyn Street. I was captivated by the trams in 1943 and was heartbroken when they finished in 1956. I was 13 at the time and, like another contributor, only rode on the "Red Buses" when visiting the area. I am currently developing the definitive history of the L&CBER and am constantly looking for personal memories, photographs and memorabilia, particularly geographical tickets and timetables. Good photocopies are all that is required – not original documents, as it is the information only that I require. Should anyone be able to help, it would be very much appreciated and they could contact me through this site. I remember these buses when I used to go to stay at my Nains in Penrhynside. They were not liked by myself or the locals who did not want the trams to stop running. Locals referred to them as the "Rock & Roll" buses which summed up the ride they gave. That’s a turnaround, Trefor. My experience and that of many others was that it was the trams which gave you the ‘Rock ‘n Roll’ treatment, especially those with four-wheel trucks. I travelled a lot on trams when a boy (London) and am glad to say that an aunt of mine humoured me by going on them for me instead of the far faster Tube trains, bless her! In the early 1950s the delightful Hastings trolleybuses – by then operated by Maidstone and District – proudly carried the fleetname "Hastings Tramways Company." As a young enthusiast I found this delightful – and I also loved the description of the majestic Hastings and St.Leonards Promenade on the destination blinds – "FRONT." Re Chris Y’s comment on the Hastings destination "Front" if you go to the outer Hebrides you will find buses in Stornoway bearing the destination "Back" – a village around 6 miles out on the road to North Tolsta. "Front" and "Back"! Now that would make quite a route to rival Lands End to John O’Groats, especially if it were undertaken in a 5LW powered utility Guy Arab (max speed 28mph). And, of course, on the return journey southward you would be travelling Back to Front! Reminds me of the WWI newspaper headline: Haigh flies back to front.